Things have finally slowed down a bit, so I dragged poor hubby outside today to enjoy the tundra. I admit, I also haven't been wanting to do anything because it's just been so insanely cold outside. A couple weeks ago, I tried to do a fashion post. I got in my outfit, went outside for 10 seconds... felt the wind, and ... screw it!.. came right back in. Flower Necklace: Valentines gift from Aaron :) Such a thoughtful guy he is. How was everyone's New Year's and Valentines day? We spent part of New Year's in Chicago, visiting family and friends. Grandparents then traveled up to Minnesota to spend Chinese New Year's with us in February. It has been almost 4 months since Grace's last surgery. She has been doing unbelievably well! She is standing with assistance, and scooting herself all over the house in her little walker. She is still pretty weak on the left side, and you can tell her left leg muscles are definitely smaller, but she sure is strong on the right side!! Her first words are "baba" and "hi". Now she's really starting to showcase her personality- much more vibrant and sassy than I ever was when I was a baby (according to my parents). It's so incredible to see her grow and finally have a few months of peace and quiet. I finally feel like I'm able to experience being a mom, and not a crazed, sleep deprived lunatic spending every moment in the hospital freaking about her health. Seeing your loved ones suffer is truly one of the worst feelings in the world, especially your children. There are so many children with medical problems that affect their lives in so many ways. We experienced this with Grace, but I can't imagine what parents with children who have active chronic issues go through, or when they lose their children to their diseases. Every time we pray for Grace, we keep in mind all the families out there who need prayers more than we do. You are in our thoughts! wow gorgeous outfit! you look so chic and so stylish! love the coat! so gorg! xO! Awwww missed reading your posts!! 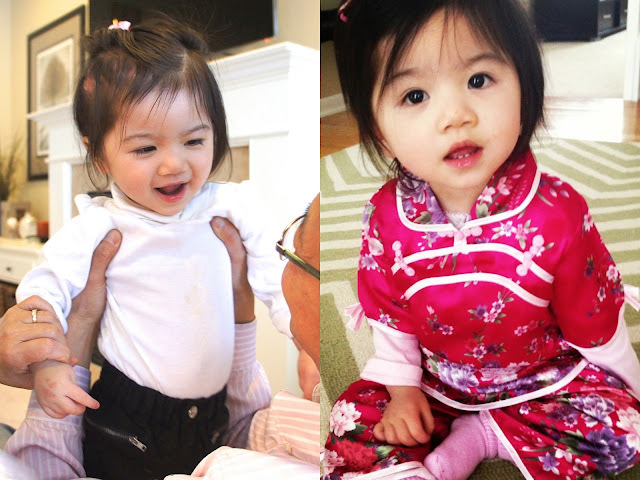 :) Grace is so cute and love her little chinese dress!! That necklace and bag are to die for!! From reading this post I can say you are a soul Christy. You touched my heart! I am so happy for your little one, she is precious! As for the outfit, I looove it! This necklace gives so much to the look! Thank you dear! I'm following you back! 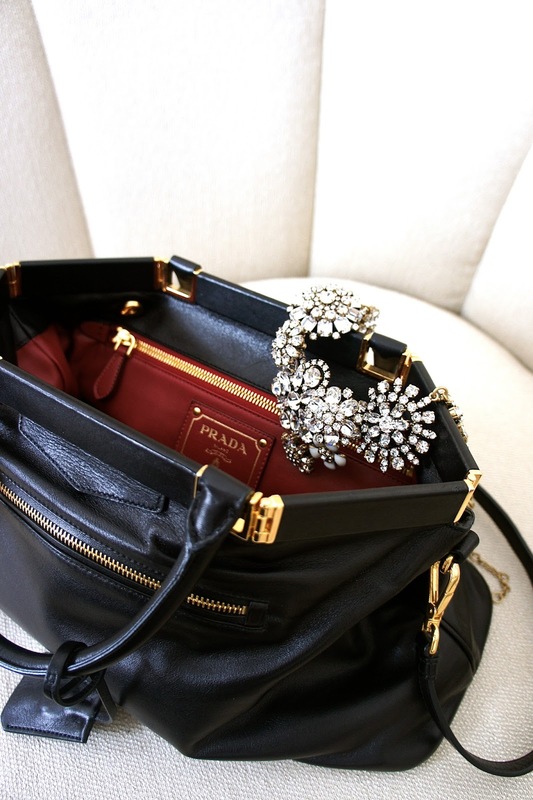 Your handbag is stunning! I love your classic style. Really beautiful. awww she is so cute! nice to hear she is faring well, sending good wishes her way :) props to you for being a trooper in the cold. love the peek of plaid! Nice look, i love your coat! 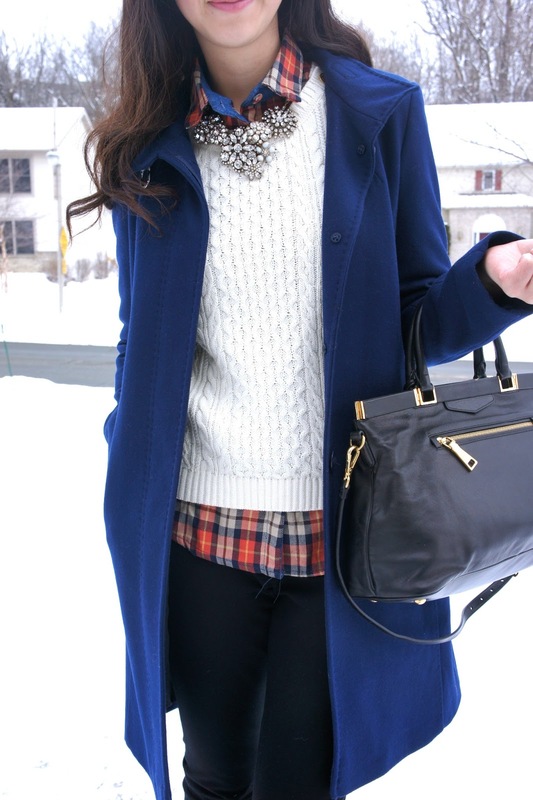 This is such a classic winter look and I love that you incorporated plaid into your outfit too. P.S. Your baby is very adorable! This is an amazing look! I love the colour of your coat, it suits really good with the rest of your outfit :) And your daughter is absolutly the cutest little girl ever ! Perfect winter layering. The richness of color stands out so well against the snowy background! By the way your daughter is too adorable!! You have a nice blog. I follow you, visit my page and tell me what do you think. perhaps we can follow each other. How adorable is your little girl?! I'm so glad you commented on my blog so that I could find yours. I love this look and your Valentine's gift is stunning! Looking forward to more outfit posts from you pretty lady. oh my gosh your little girl is so adorable! & I love your coat, great color! & thanks much for visiting my page! That coat is so amazing! Mine the same color and I just love it - plus, it helps that people know how to spot me around campus. :P Hope that your studies continue to go well! And your little gal is the cutest thing that I have ever seen! 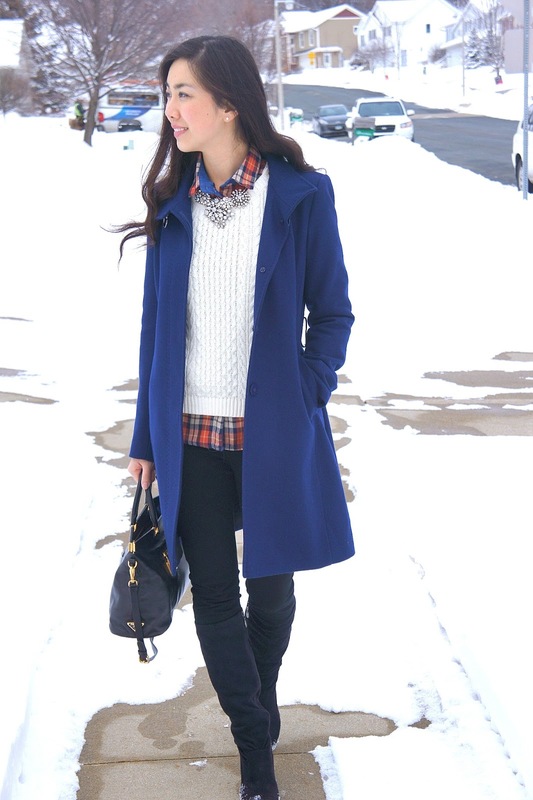 Your flannel matches so well with the blue coat and your purse is to die for! Your daughter is so cute as well! She looks so cute in her Chinese New Year outfit. The coat is so beautiful, both the colour and the structure of it! And Grace is beyond adorable! Love this preppy outfit! Looks like it came out of a magazine :) And glad to hear Grace is doing well - I read your story and I can't imagine what you're going through. Praying that your little girl will be healed! She is adorable! Grace - what a perfect name on her! I am so happy that Grace has been doing so well! You look beautiful. I love that gorgeous necklace! Such a stunning look! I'm loving the necklace and the bright blue, not to mention the layers! Perfect winter look. Glad to hear Grace is doing better too :). Sounds like things have been super busy for you but you still took the time to look amazing! I just adore your outfit from the top to the bottom! I am following you on bloglovin now check me out too if you like! Your blue coat is so pretty and I just love the way you've put this whole look together. Grace is such a lovely girl as well! So happy that she is doing well! Super chic! I have a small obsession for Prada bags too :) kiss! I love your outfit. 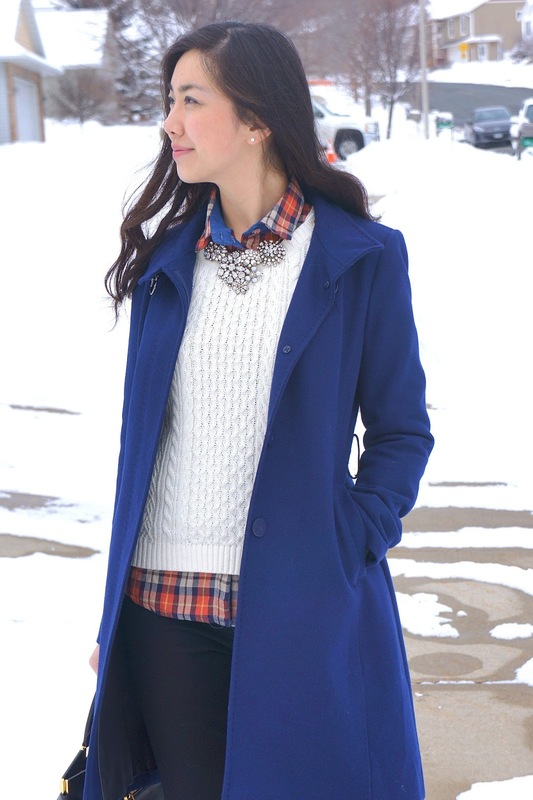 The blue coat and the blue in the plaid top seem to match perfectly! Plus that is an amazing necklace. Sweet guy to have gotten it for you. The pictures are beautiful and it sure does look cold there. Hopefully work and training and everything will slow down now. Work has been keeping me insanely busy too. I got a surprise call this morning though, before I even woke up to tell me that we would not be working today. A water main break has resulted in no water so no work! I am really appreciating the day off. Sorry to hear about your little girl. She is so adorable. I will definitely keep her in my prayers. Love the color of the jacket. Grace is the cutest! 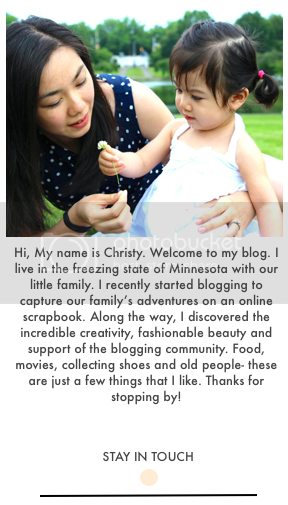 Your daughter is beautiful and your blog is amazing! I have a small obsession with Prada bags, too! You look really great and that coat and necklace are so nice. Have a great day. You look great and I am definitely loving that bag! You live in Minnesota?? I go there like every year! Hahahah to Duluth & Minneapolis. So close! 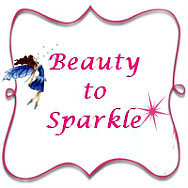 Hi Christy, this is my first time in your blog and fell in love with it--with your style mostly. The plaid under knit? Adorn with a statement necklace? Original. Also, I don't know what happened to Grace but I am happy that she is doing well after surgery. She is beautiful! Grace is such a strong beautiful girl. Hope she continues to do well! 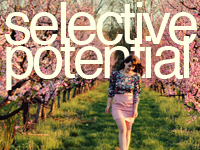 Also your outfit is gorgeous, very chic. I love that necklace. i am now your new follower! I added you onto my reading list for blogspot! Oh I love your beautiful blue coat! 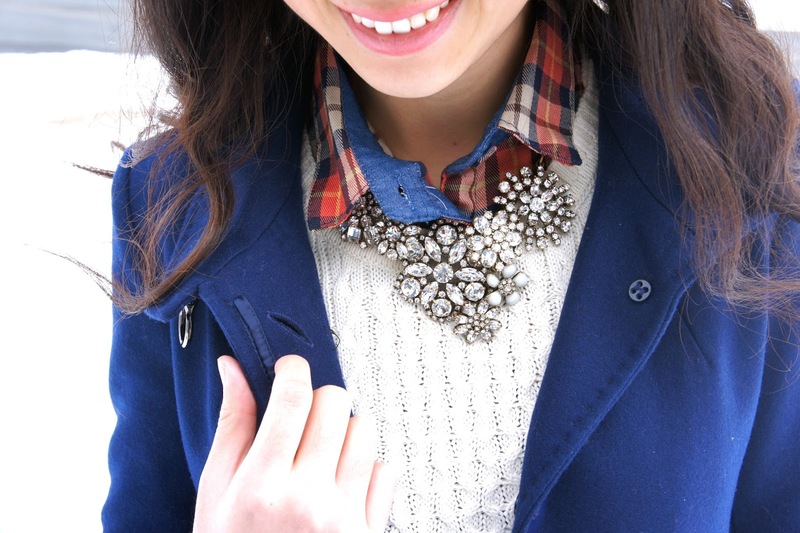 It looks great with that plaid, and the statement necklace is gorgeous! So darling! Love how you layered the whole look! Beautiful! Would you like to follow each other?? Your baby Grace is super adorable. A miniature of you. I love love Prada too. Such classic and luxury. You look great by the way. This is such a chic outfit. 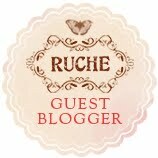 Thank you for visiting my blog and for the sweet thoughts. Happy International Women's Day! You're truly a wonderful and strong woman. My cousin's daughter is suffering from severe burns and I applaud her for being so strong too. I love your necklace and I think snow is the best backdrop for any photos. Have a great weekend!